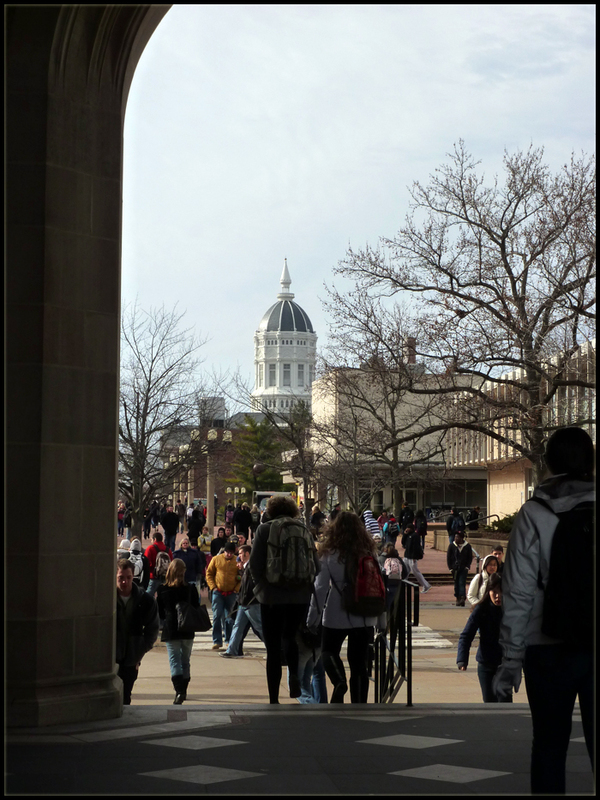 This view looking west through the arch of the Memorial Union across Lowry Mall, with the dome of Jesse Hall in the distance, captures the relationship between the red and white campus of the University of Missouri. Jesse Hall, completed in 1895, anchors the red campus. Lowry Mall provides the transition to the white campus that is anchored by the Memorial Union. The red campus is comprised of the original academic buildings on Francis Quadrangle to the north of Jesse Hall, while the more recently constructed buildings to the south of Jesse Hall form the Carnahan Quadrangle. The white campus is comprised of the buildings constructed to the east of the original red campus in collegiate gothic style using native Missouri limestone. The tower of the Memorial Union was completed in 1926 to honor MU alumni who lost their lives in WW1. Its north wing was completed in 1952, the A. P. Green Chapel in 1959, and the south wing in 1963. Lowry Mall, with its brick pavers and formed pebbled concrete retaining walls and planters, provides a seamless transition from the red to the white campus. Lowry Street was converted to a Mall in 1984 to provide unimpeded pedestrian access to the heart of the campus. G. M. Chippendale was employed at MU as a faculty member and administrator from 1968 to 2005.